In a medium saucepan, heat a few inches of water to boiling. Once the water is boiling, shred the potatoes quickly and submerge in the water. Cook for 3 minutes and then drain the potatoes in a fine mesh strainer. Press down with a paper towel (or spoon) to remove as much water as possible. But be carefully, it will be HOT. Set a large nonstick skillet on the stove. Heat it on medium heat (actually a hair below medium is best). Add olive oil to the pan and spread around. Add the potatoes to the skillet and spread to an even layer. Cook for 5 minutes, then flip and cook for an additional 5 minutes. Flip again. Add the butter to the pan, allowing it to melt. Quickly toss the potatoes with the butter. Let cook for 5 more minutes, flipping once, until golden. Here is our second post on fabulous fall breakfasts. Don't miss the first one from last week: Pumpkin Muffins. Hash browns, an egg over easy and fresh fruit ... delicious. This isn't a diner plate though -- it's something you can make at home in less than 30 minutes. But let's talk about those hash browns. 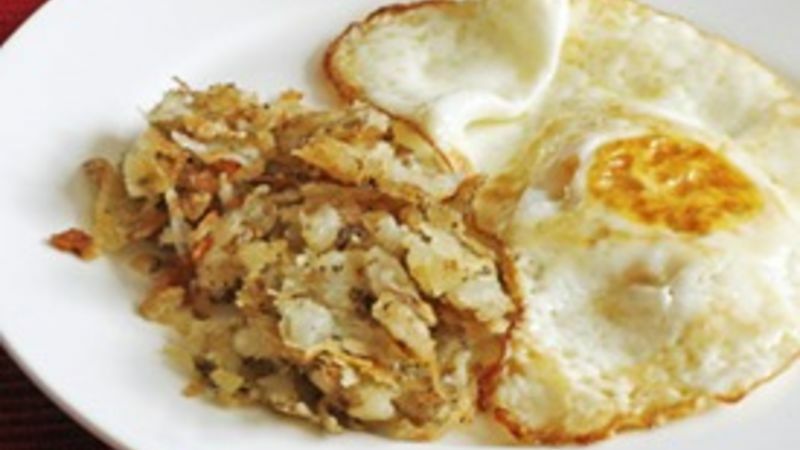 Making homemade hash browns seems like an easy task: shred potatoes, fry, season, serve. But it's not quite that simple. See, if you shred and fry the potatoes, you will get perfectly tasty hash browns that are ... blue. Kind of a slate blue, with bits of golden brown. And while they will be perfectly edible and tasty, they won't be very pretty. And what's that thing they say about eating with your eyes first? So, if you want perfectly cooked, pretty, delicious hash browns, you have to start by parboiling the potatoes. Basically, you boil water, shred the potatoes quickly, cook them for three minutes and then carefully squeeze out any excess water (it will be hot, so be careful!). That small, fast step will stop oxidation (the process that makes them turn blue) in its tracks and speed up the overall cooking time. Then you press the water from the potatoes, and proceed with the fry, season and serve steps. With my delicious Buttery Homemade Hash Browns, you finish them off with just a bit of butter. It helps them get that final browning and makes them taste out of this world. You will never look at hash browns the same after this.